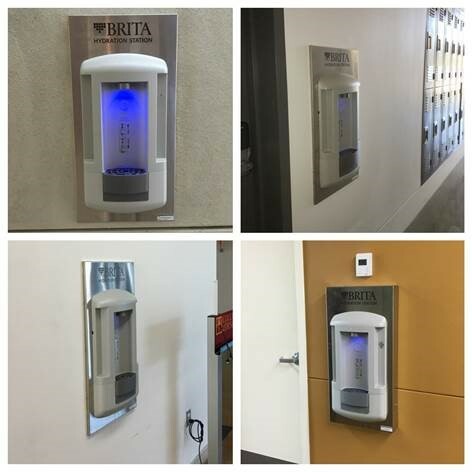 Four donated Brita Hydration Stations were recently installed at College of the Desert in Palm Desert, CA with the support of Mission: Readiness – Military Leaders For Kids and Regional Access Project Foundation. College of the Desert serves over 10,000 students and, as one of 112 community colleges in California, represents a vital part of the world’s largest system of higher education. Increasing access and consumption of safe drinking water where youth live, learn and play is an important initiative taking hold in California and across the nation. Studies link rising obesity rates to the consumption of sugary beverages, among other factors. These are beverages with added sugar and include sodas, sports drinks, and fruit-flavored drinks. Water is an essential, calorie-free alternative that can be used to help combat childhood obesity and improve students’ readiness to learn by maintaining proper hydration. During a picnic to recognize supporters of the Ranch, Mission: Readiness – Military Leaders For Kids members, Major General (Ret.) John Bianchi, U.S. Army and Brigadier General (Ret.) Guido Portante, U.S. Army helped unveil a new Hydration Station donated by Brita in partnership with Mission: Readiness that will serve 9,000 youth from across the region who participate in quality programming at Pathfinder Ranch on an annual basis. Haws Corporation Tempered Water Nevada USA, Singapore - These 5 Emergency Equipment FAQ’s Can Keep You Out of Trouble « HOME » Fraud Labs Pro Fraud Detection and Fraud Detection Solutions: How to manually test an order for fraud?